Welcome to the May edition of IVJ. Many new and returning friends have dropped in to lend their voice to this issue, so please join us in welcoming them. I believe it is a fantastic issue full of beauty, light, growth, and truth. To all our service members, past and present...Thank you, and Happy Memorial Day. 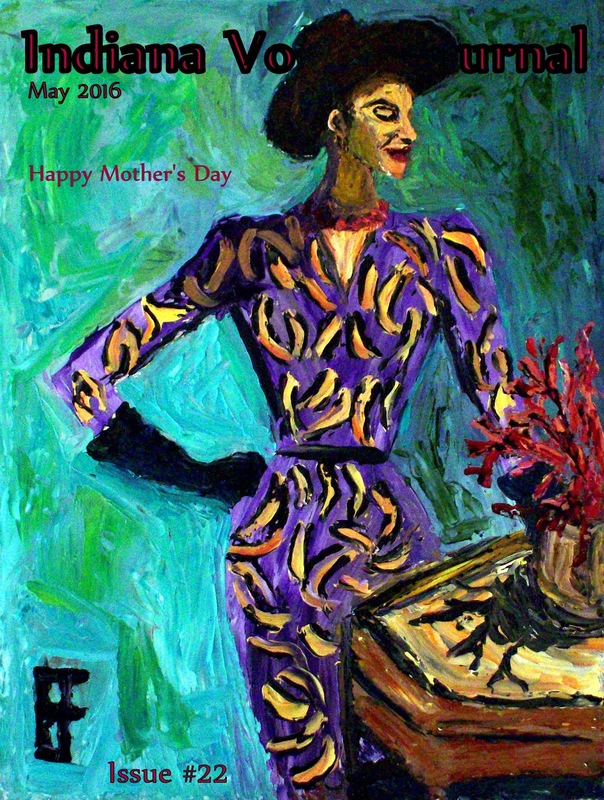 To every person raising, nurturing, and loving our children...Thank you, and Happy Mother's Day! A special thanks to Allen Forrest for contributing his georgous painting for our cover page. A Mother's Day Special Essay and an invitation from Elizabeth Brooks: "The Call of the Child"
Three Poems by Sheika A: "Blue Dawn at Koh Samui", "Fire at Koh Samui", "One cannot write about shadows"
Three Poems By David Bankson: "How to Live Off the Land", "Driftwood", "I am a War Criminal"
Three Poems by Mary E. Bone: "The Rose", "My Trip to the Petaluma", "The Falcon"
Mary Bone has had poems published in magazines, journals and newspapers. Her most recent poem was featured at Poebita Poetry magazine. Another recent poetry acceptance was from the Oklahoma Today magazine. My poem, ”Other Warriors”, will appear in their July/August magazine. Three Poems by Douglas G. Campbell: "Fathers’ Words", "Hayden Pond, Rain, November 11", "Broken Steps"
Two Poems By Edilson A. Ferreira: "Moments", "Money, As Viewed By A Poet"
Mr. Ferreira is a Brazilian poet published (or upcoming to) in venues like Right Hand Pointing, Boston Poetry Magazine, The Lake, The Stare’s Nest, The Provo Canyon, Red Wolf Journal, Subterranean Blue, Highland Park Poetry, Whispers, West Ward Quarterly, Indiana Voice Journal, Synesthesia, Dead Snakes and various others. Short listed in four American Poetry Contests, lives in a small town with wife, three sons and a granddaughter and is collecting his works for a forthcoming book. Two Poems By Geosi Gyasi: "War Against You", "Mother's Tears"
"Geosi Gyasi is a book blogger, reader, writer, and interviewer. His work has appeared or forthcoming in Visual Verse, Verse-Virtual, Piker Press, Misty Review, Silver Birch PRESS, Linden Avenue, Expound, Tuck Magazine and elsewhere. He is the author of the forthcoming book, “Geosi Interviews Fifty Writers Worldwide” (2016) from Lamar University Press Books in Texas, U.S. He is the winner of the 2015 Ake/Air France Prize for Prose. He blogs at http://www.geosireads.wordpress.com"
Three Poems By Joan Higuchi: "Rags", "Rhapsody", "Claiming Marianne"
Joan (Kirchgessner) Higuchi, an RN and frequently published poet from Long Island New York was awarded first prize in a category of The Writer's Digest contest shortly after she resumed writing after her retirement twenty-five years ago. Her work had originally been published while she was a student, but was deferred while she and her husband Paul raised their two daughters and she pursued her career. She additionally won the "Miracles" competition sponsored by the Walt Whitman Birthplace Association and successive top prizes in the Performance Poets Association contests. Publication of a collection related to her experiences in the field of Mental Health is in process and her first chapbook of nature poems, "A World of Small Things Singing" (Finishing Line Press) is available on Amazon.com. Three Poems By Damien Irwin: "Learning to Meditate", "He Knew No Haste", "Ars Poetica After You"
Damien Irwin currently resides in Fort Smith AR. He is a native of Eastern Oklahoma who grew up in the foothills of the Ozarks. His poetry and fiction have been published in Applause. Three Poems By Dr. Emory Jones: "The Patriot", "Bones Die Hard", "Magic Medicine Show"
publication in such journals as Voices International, The White Rock Review, Free Xpressions Magazine, The Storyteller, Pasques Petals, The Pink Chameleon, and Encore: Journal of the NFSPS. He is retired and lives in Iuka, Mississippi, with his wife, Glenda. He has two daughters and four grandchildren. Two Poems By Lynda McKinney Lambert: " Musings on “E”", "Crystal Healer"
Lynda McKinney Lambert is the author of “Concerti: Psalms for the Pilgrimage” published by Kota Press. It is a book of poetry and short essays Lynda wrote over several years while spending her summers in Salzburg, Austria where she taught a course in writing and art each summer. She is a retired professor of fine arts and humanities from Geneva College in western Pennsylvania. Lynda currently authors two blogs on writing, the humanities, art, and faith. She is a freelance writer and her poetry and essays appear in numerous books and literary journals. She also exhibits her fiber art in exhibitions worldwide; her art work is in many public and private collections. Walter E. Harris III (known to fellow poets and friends as Mankh) is a writer, small press publisher, editor, and Turtle Islander. He hosts a the audio show, Between the Lines: listening to literature online. A Poem By Alice Jane-Marie Massa: "Welcoming Springtime in Indiana"
After earning master’s degrees from Indiana State University and Western Michigan University, Alice Jane-Marie Massa--still a Hoosier at heart--taught for 25 years, including 14 years of teaching writing and public speaking at Milwaukee Area Technical College. Alice invites you to visit her blog: http://alice13wordwalk.wordpress.com, where she weekly posts her poetry, essays, memoirs, or short stories. Her writings on Wordwalk frequently focus on her Indiana home of Blanford, her guide dogs, her Italian ancestors, and writing. Away from her desk, Alice most enjoys long walks with her third Leader Dog (Zoe), reading, container gardening, and the television program Jeopardy. Two Poems By Carole Mertz: "Hard Times", "Empty Canisters of the World"
Carole Mertz has poems in various online publications. Her reviews, essays, and short stories appeared in Arc Poetry Magazine, Ascent Aspirations, Conium Review, Copperfield Review, CutBank, Mature Years, Mom Egg, Toasted Cheese, Women on Writing, Working Writer, World Literature Today, With Painted Word, WPWT, and in Seek Publications. Two poems won Wilda Morris’ Poetry Challenges, Summer, 2015. Carole writes in Parma, OH. Five Poems By Milton Montague: "Because", "Eleven Smiling Faces", "For the Birds", "On the Grass", "Orion the Hunter"
milt montague, memontagues@gmail.com, 205 west end ave, new york, new york 10023, was born and raised in new york city, survived The Great Depression, the school system, and World War ll. Finished college, married happily, raised 3 lovely daughters, retired. Back to college and after 20 years discovered poetry at 85. Now at 90 plus years, he has 78 poems published in 26 different magazines in under 3 years. Three Poems By Judy Moskowitz: "Jazz Me", "Interrupted Madness", "Slam"
Judy Moskowitz is a jazz pianist from New York City . She started playing at the age of three and attended the Julliard School of Music. Judy began writing poetry three years ago and has been published on www.thepoetcommunity.com and is a featured poet in Michael lee Johnson’s antholgy Moonlight Dreamers of Yellow Haze, available on Amazon. A Poem By Shirley Pearson: "Dad And I – Oh Horrors!" Shirley Pearson is a freelance writer and editor. Her first job out of high school was with Sears, writing copy for their Big Book. She has continued to write for many publications over the years, taking awards for her stories and poetry. For the past 27 years Shirley has led writing groups and was head of PR for ElderCollege at Terra State College in Ohio. Currently she is working on two books and writes poetry as her muse allows. A widow, Shirley’s two cats, her elderly father, daughter, granddaughters and great grandchildren keep her busy. Three Poems By Sunil Sharma: "Et tu Brute? ", "Phantom Road", "Red Moon"
Tom Sheehan has published 23 books and has had multiple work in most of the following publications: Ocean Magazine, Rosebud, Linnet’s Wings, Serving House Journal, Eclectica, Copperfield Review, KYSO Flash, La Joie Magazine, Soundings East, Vermont Literary Review, Literary Orphans, Indiana Voice Journal, Frontier Tales, Deep South Magazine, Western Online Magazine, Provo Canyon Review, 3 AM Magazine, Vine Leaves Journal, Nazar Look, Eastlit, Rope & Wire Magazine, The Literary Yard, KYSO Journal, Green Silk Journal, Fiction on the Web, The Path, Faith-Hope and Fiction, The Cenacle, etc. He has 30 Pushcart nominations, and five Best of the Net nominations (and one winner) and short story awards from Nazar Look for 2012- 2015. Swan River Daisy, a chapbook, was just released by KY Stories and The Cowboys, a collection of western short stories, is in production at Pocol Press. Three Poems By John Stanizzi: "What Cannot Be Held", "What is Not Understood", "First Timers"
Casey Vittimberga is a California native whose work has appeared in various literary magazines including Polaris, The Walrus, TeenInk and If & Only If. She is the recipient of the 2013 Ardella Mills Prize in Literary Composition and the second place winner of the 2014 Ohio Northern Fiction Contest. She graduated with a creative writing degree from Mills College, moved to the Silicon Valley with her angsty pet rabbit and now works in tech. Born in Canada and bred in the U.S., Allen Forrest has worked in many mediums: computer graphics, theater, digital music, film, video, drawing and painting. Allen studied acting in the Columbia Pictures Talent Program in Los Angeles and digital media in art and design at Bellevue College (receiving degrees in Web Multimedia Authoring and Digital Video Production.) He currently works in the Vancouver, Canada, as a graphic artist and painter. He is the winner of the Leslie Jacoby Honor for Art at San Jose State University's Reed Magazine and his Bel Red painting series is part of the Bellevue College Foundation's permanent art collection. Forrest's expressive drawing and painting style is a mix of avant-garde expressionism and post-Impressionist elements reminiscent of van Gogh, creating emotion on canvas. Flash Non-Fiction By Bill Vernon: "The Heart Of The City"
Bill Vernon served in the United States Marine Corps, studied English literature, then taught it. Writing is his therapy, along with exercising outdoors and doing international folkdances. His poems, stories and nonfiction have appeared in a variety of magazines and anthologies, and Five Star Mysteries published his novel OLD TOWN in 2005. Bill has a non-fiction piece "Better Than Flowers" featured in the September 2014 issue of IVJ. Flash Fiction By J.Andrew Goss: "The Hardest Button"
J.Andrew Goss is an artist and writer living in the wine country of the Missouri River Hills. He is currently an MFA student at Lindenwood University. Patric Mauzy is an aspiring author from the small town of Arcola, Indiana. When he isn't focusing on his writing he is playing his guitar and making music. Phil Temples lives in Watertown, Massachusetts, and works as a computer systems administrator at a university. He's a native of Bloomington, Indiana. Phil has had over a hundred works of short fiction published in print and online journals. Blue Mustang Press recently published Phil's full-length murder-mystery novel, “The Winship Affair." He has two books due out this year--a paranormal-horror novel, "Helltown Chronicles" by Eternal Press, and a short story anthology in Big Table Publishing, "Machine Feelings." Creative Nonfiction/Essay By Elizabeth Brooks: "The Call of the Child"
Elizabeth Brooks resides in Tampa, Florida. She is originally from Trinidad and Tobago. A lover of life, family, friends, a good book, lots of laughter and continues to grow in her faith and accept many challenges. She is a librarian by profession and a part-time reference librarian at Saint Leo University, St. Leo Florida. She continues to enjoy reading and sharing her poems with many, at events in Tampa Bay.